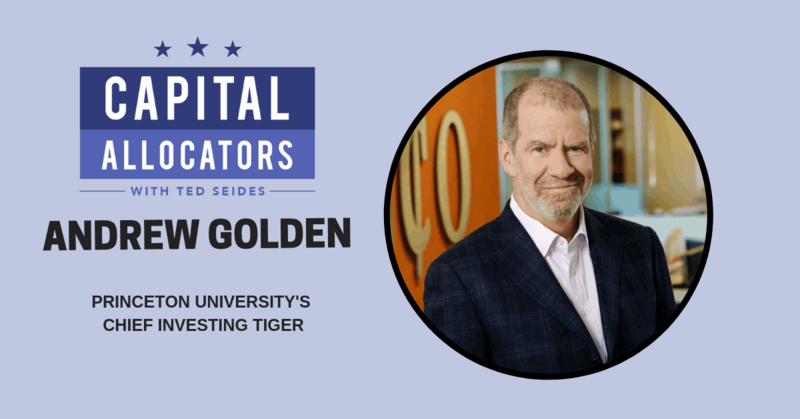 Andy Golden is the President of Princeton University’s Investment Management Company (or PRINCO) for the last 22 years. Having grown from $3B at the time of his arrival to $22.5B today, PRINCO has been among the highest performing endowments in the world. Andy came to PRINCO from Duke Management Company, where he was an Investment Director, and received his formative training in the business working for David Swensen at the Yale University Investments Office. Andy currently serves on the fund Advisory Boards of several well-known private equity and venture capital managers, including Bain Capital, General Catalyst Partners, and Greylock Partners. He was a founding member of the Investors’ Committee of the President’s Working Group on Financial Markets and serves as a Trustee of the Princeton Area Community Foundation and Rutgers Preparatory School. Andy holds a B.A. in Philosophy from Duke University and an M.P.P.M. from the Yale School of Management. Our conversation discusses Princeton’s endowment two decades ago and today, including its strategic advantages as an institution, shifts in thinking about asset allocation, decision making, team development, and partnership with managers. Andy’s long tenure in his seat, insight, and wisdom provides a treasure trove of information about how a top endowment manager practices his craft, and his subtle wit always keeps things light.